I'm a sucker for anything that takes the mundane and turns it into something really geeky. I mean, why should I get up out of a warm bed to turn off the lights when I can open my Control4 app and turn them off (or down) from under the covers? And why should I be happy with regular power outlets when I can have USB outlets instead? Why should I yell for my son to come for dinner when I can just have a robot voice summon him through our home automation system? And why should I be content to have plain, boring white plastic light switch covers, when I can have these?! That, my nerds, is an arcade-inspired light switch cover! It hads a joystick! It has shiny red buttons! It goes "pew pew"! And when you turn off the light, the Power-Up logo is lit up so no fumbling in the dark to find the light switch. Nerdy AND convenient. What more can you ask for? This has got to be one of the most silly creations and yet... 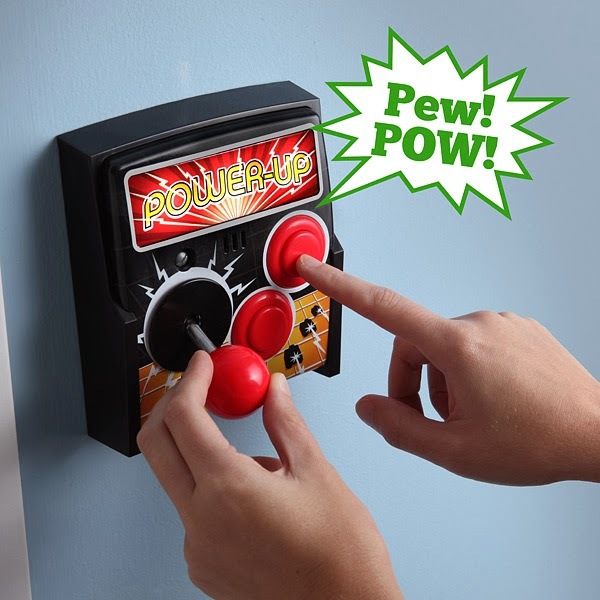 I totally want to buy it and secretly install it in the playroom for the Dude's birthday. I mean: "pew pew" sound effects?! So. Much. Like. Naturally, it's from ThinkGeek (where all kewl stuff is born).